Are you looking for a workout that can complete your makeover from flab to fab? Are you looking at toning your muscles and getting that six-pack ab? Most of us want to have a fit body, but are unaware of the kind of exercises that help us achieve that. If you are exploring ‘the’ workout that can suit your fitness needs, then you have come to the right place! This post deals with the top aerobic and anaerobic exercises that can help you reach your fitness goals! So why the delay? Go ahead and give a read! 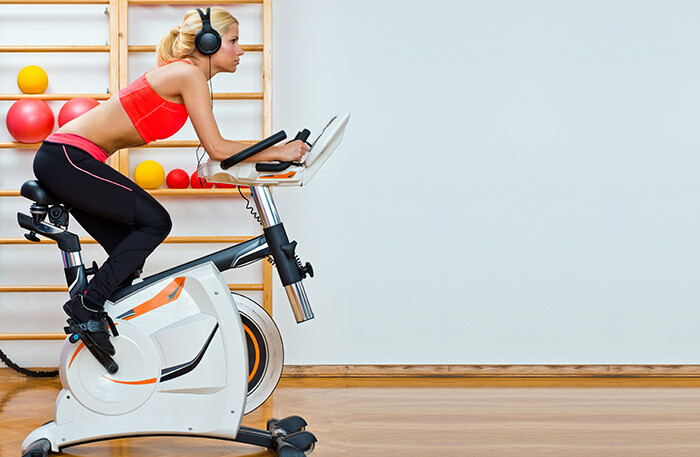 What Is The Difference Between Aerobic And Anaerobic Exercises? These exercises help burn fat with the help of oxygen and carbohydrates to provide your body a steady supply of energy. These exercises are low-intensity and longer duration workouts. Your fitness trainer may recommend this form of exercise if you want to lose weight. These exercises convert the carbohydrates in your body to energy to help the muscles produce force. It is a high-intensity and low duration workout. During such exercises, lactate build-up in your muscles causes fatigue. Your fitness trainer will recommend it if you are looking for building muscle strength. Here is a list of the popular aerobic and anaerobic exercises. Trainers and fitness experts advise adding interval training to your regular cardio workout to expedite your weight loss. Challenge the body to come out of its comfort zone and work harder. You need to push up the pace of your workout for a minute or two and then get back to your regular pace for ten minutes, depending upon your recovery time. Repeat the cycle throughout your workout routine. Walking is the simplest form of aerobic exercise. You can vary your pace of walking depending upon your stamina and fitness levels. Since it does not require any particular gadget or equipment, you can simply put on your walking shoes and start your journey to fitness. Walking indoors, outdoors, or on a treadmill, provide you the same benefit. However, walking outdoors in the early morning is better as you can inhale some fresh air. It is the best option for those who find it hard to perform strenuous exercises due to joint problems, but still want to remain fit. Sprinting is a form of anaerobic exercise that is good for the heart and overall health. To get maximum benefit, you need to vary your pace of running after every five to ten minutes. With regular practice, you can increase the duration and pace of running. For best results, you should run for at least 15 to 30 minutes. Lunges provide workout for the lower body muscles. Just like squats, lunges also contribute to improving your balance. To perform lunges keep a straight spine and take a big step forward. Now, bend the front knee at 90 degrees. Balancing your weight on your back toes, slowly lower the back knee, but make sure that it does not touch the floor. It is a form of anaerobic exercise and is similar to running sprints. First, start swimming at your normal speed. Then slowly increase the pace of swimming and maintain it for a minute. Return to your normal pace and repeat the cycle. Continue swimming like this for half an hour at least. You should include at least a few anaerobic exercises in your daily routine. Heavy weightlifting is one such exercise. However, you should perform it only under the supervision of a certified trainer. Lie down and put your feet forward in the stirrups. 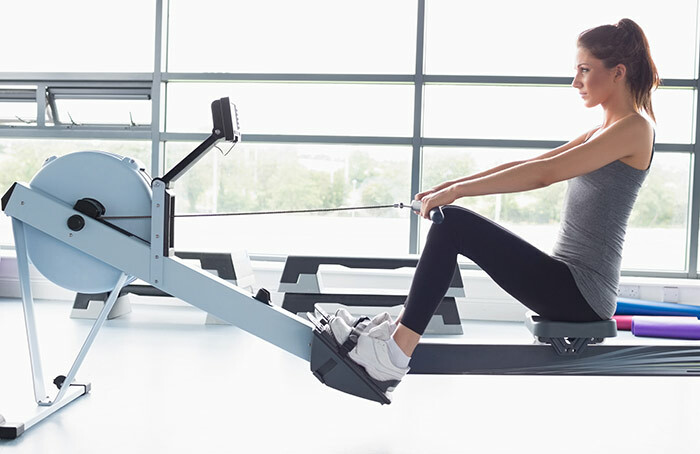 Pull your arms backward and stimulate a rowing motion. It is a good workout for your abdomen, leg and arm muscles. Divide the session into a warm up and workout intensely as much your muscles can endure. Keep alternating the cycle. Jumping rope is no more a child’s game. The International Sports Conditioning Association boasts of its aerobic and anaerobic qualities. You can increase or decrease the pace and the duration of jumping to get the advantage of anaerobic respiration. However, jumping rope performed at a normal speed is an aerobic exercise. It involves only a particular group of muscle. Such exercises do not allow the stretching or lengthening of the muscles as most of the times the muscle does not move at all. Physiotherapists recommend isometric exercises for patients who sustain muscle injury. It is a type of physical therapy involving static exercises. In this form of exercise, an individual has to remain in a stationary position without moving any part of the body. The best example of isometric exercise is to remain in one position holding a weight or pushing a wall. When you exercise aerobically like in the case of biking, your body uses the fat and glycogen for fuel. You can carry on this type of moderate exertion for long periods. You can easily turn this exercise into a few sessions of anaerobic exercise by intensifying the speed in between. So now that you know the various types of aerobic and anaerobic exercises, go on and pick the exercise that suits your fitness needs. Don’t delay your trip from fat to fit anymore! This is all about aerobic vs anaerobic exercises. If you find this article informative and interesting, do leave us a comment below. If you are a fitness enthusiast, please share your fitness regimen with others here!